Well, this review represents a first for me. 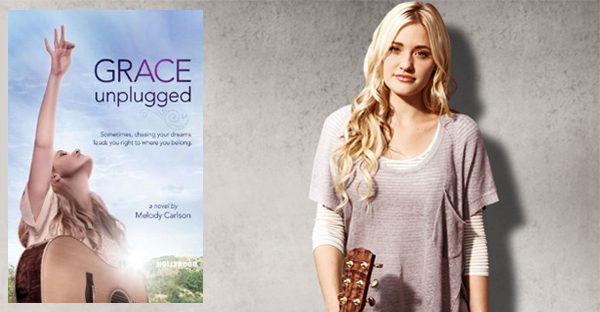 I'm reviewing the book Grace Unplugged: A Novel , by Melody Carlson in advance of the movie which is coming out in theaters on October 4th. Before I accepted the book, I watched the movie trailer to see whether or not the storyline interested me. The book, I'm fairly certain, was commissioned after the movie was in production because the book comes out September 1st and the movie on October the 4th. At any rate, the movie piqued my interest for one particular reason which I'll share in a moment. 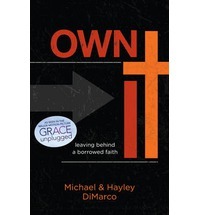 What cinched it for me was that Hayley and Michael DiMarco were charged with writing a devotional to accompany both the book and the movie. Hayley DiMarco, you might recall, wrote The Fruitful Wife (linked to my review) which still ranks as one of my top favorite books on being a wife and her name is the one that sold me on this new project. I'll also talk about the devotional in a second. Straight up, I'm going to tell you that you can either read the book or watch the movie and you'll be getting the same story. I don't even feel like I have to see the movie in order to say that. The trailer alone gives me enough clues that this is so. Personally, I'd much rather watch the movie than read the book in this case. Grace Trey is an eighteen year old wanna-be singer who serves (or, "performs") with her father, Johnny, on the church worship team. Her father is a former rockstar who converted to Christianity and left Hollywood behind him. Grace has a desire to be a music star just like her father once was and eventually she finds an opportunity to break into stardom. Her parents actively advise her against trying to become a star (knowing the cost involved) but Grace ignores them, running away from home to "follow her dream." She succeeds in attractive the notice of a big record label and is on the path to greatness when a young intern, who just so happens to be a Christian, causes her to question why it is she is pursuing fame. Eventually, she realizes that she doesn't want to compromise her morals to be a star and she returns to her childhood faith, ultimately running on the Contemporary Christian music circuit. And everyone is happy. Yay! As my regular readers are aware, my dad was a worship leader at our church growing up and that angle of the story caught my attention because I wanted to see exactly how Carlson and the producer of the movie would handle the topic of worship. In my opinion, they handled the topic quite poorly. As Carlson describes for us, Grace's dad understands that worship is about God and not about himself. However, she doesn't quite know how to instruct the reader on the subject and importance of corporate worship and so she avoids doing so. Carlson sticks to trying to explain the dad's belief in one sentence only, but in the meantime she also keeps referencing the congregation (i.e., the Body of Christ) as a crowd watching a performance. So while I recognize that she wants me to think that Dad is focused on Christ, I can't honestly believe it. I can't believe that he truly understands the point of a corporate worship service because if he did, he would have been instructing his daughter (and the rest of the congregants) on the entire point of worship, the history of worship in the church, scriptural arguments for different kinds worship and, ultimately, our duty in worship. You might argue that in a piece of fiction such as this one, the character shouldn't be required to go into such detail but when the entire subject matter of the story is worship then I would argue that you do have to dabble in it to a degree. Grace has no concept of her reason for "performing" on the worship team. She is putting on a show because she has clearly been taught that when you stand on a stage you are performing. Her dad never instructs that she is not performing and as the saying goes, 'you can't teach what you don't know.' He didn't teach it; he didn't know it. It should come as no surprise or heartbreak to anyone - character or reader-of-book - that Grace thought she was hot stuff. "As the food was passed around, Johnny tried to shake off his concerns over his willful daughter. After all, she was still a teenager. They were supposed to go through stages of rebellion, independence, and autonomy. All kids acted out at times. Besides, he reassured himself, Grace was a good Christian girl. And on her way to youth group. Really, what more could a dad wish for?" The devotional, Own It: Leaving Behind a Borrowed Faith by the DiMarcos seeks to communicate the message that "renting, borrowing, or faking your faith is a waste of time." In this, I most definitely agree with them. Actually, to be fair, I think the devotional is the best of this trio of new "hip" releases. The DiMarcos are quick to say that, "The difficulty of faith doesn't come from the lack of feeling or even action but from the lack of divine knowledge - the knowledge of who God is and the depth of His love." I believe that's an accurate statement. But the title of the book and the explanation for it bug me. "Own it." I get what they are trying to communicate: that you have to make a statement of faith for yourself as to what you believe. You cannot be a Christian because your parents are or your great- grandparents were. You have to be one all by and for yourself. The problem for me is that I recognize that technically I do not own; I am owned. The DiMarcos, on the whole, say a lot of correct things. They are basically about the businesses of presenting the Gospel message to teens with this book. Come to Him all ye who are heavy laden and He will give you rest. Confess your sins and He will be faithful and just to forgive you. Cast your cares upon Him for He cares for you. Be still and know that He is God; He is perfect; He is sovereign; He is eternal. All of these good and right things. And, as I say, I think the devotional is the most solid of these three new items for us to examine. But the title just gets me and I am turned off from the get go. Yes, I do realize that I am being incredibly "harsh" in all of this and that there will be plenty of people who disagree with what I am saying. I just think that we can give our kids more than this. We shouldn't be so consumed with the idea of couching truth in Hollywood glitter, like we're trying to hide vitamins in ice cream or something. I think we should be braver with our kids and not think that the only way they will stick with the Christian faith is if it looks and feels cool enough for them. That's the wrong reason for them to be in the church in the first place. We shouldn't want "good Christian kids" because those people are only moral bandaids on a hurting society. We want Christian kids who care about Who God is, how they go about worshiping Him and His plan for their lives because those Christians are the ones that will be truly changed and who God will use to change the world. I received both the book Grace Unplugged and the devotional, Own It from Grace Hill Media in order to facilitate this review. I have received no other compensation. All opinions are 100% my own (should you actually doubt that). "the history of worship in the church, scriptural arguments for different kinds worship and, ultimately, our duty in worship"
I would like to know more about the history of worship and scriptural arguments for different kinds of worship. Where can I find this info? I appreciate your review and agree with all you said. As usual, I enjoy your negative reviews at least as much (if not more) than your reviews of books you loved. But seriously, YES, I absolutely agree with you, as a parent of two teens, that too many people think teens are not capable of having real and deep conversations and studies and growing in a deep relationship with the Lord. We are missing the boat here as we elevate education and academic pursuits to idol status while at the same time minimizing the christian faith to fun and fluff and then wonder why kids "lose their faith in college". And I had to grin at your cynical take on christian merchandising. I'm interested in the topic of music and dreams/callings and worship. But I really despise mediocre Christian films. Why can't Christian actors act?? Is the book/movie saying that you cannot be a Christian AND be successful in the music industry? That you have to choose?